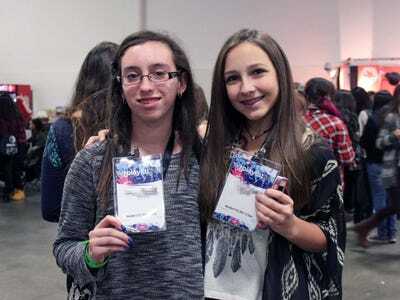 Madeline Stone / Business InsiderStacey and Christina, two 13-year-old girls at Playlist. 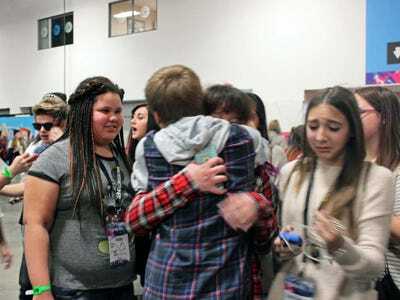 YouTube creators have become celebrities in their own right, accumulating millions of views and hordes of fans who follow them wherever they go. According to a recent survey by Variety, teens worship YouTube stars even more than they love mainstream celebrities like Jennifer Lawrence or Selena Gomez. 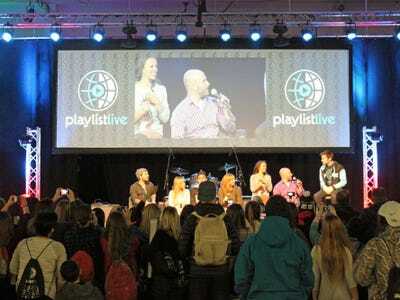 We got a glimpse into the world of YouTube fandom when we attended Playlist Live, a three-day convention-style event for online video creators and fans. 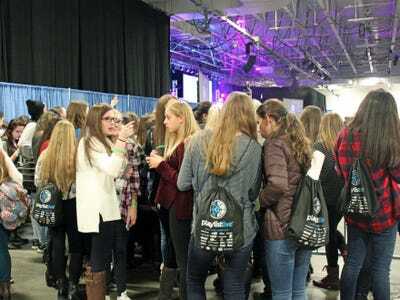 The event was insane, with thousands of teens waiting in crowded lines to get autographs and selfies with their favourite YouTube stars. Plenty of high-pitched screaming was involved. 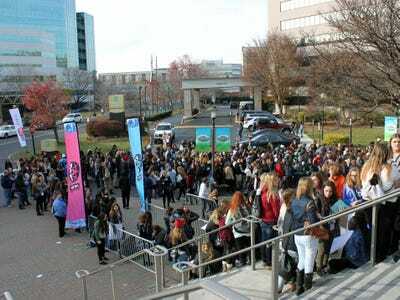 We arrived to the Meadowlands Exposition Center in Secaucus, N.J. in the early afternoon on Saturday. The line to get in stretched down the block. 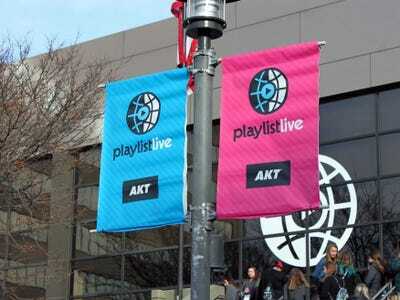 Playlist started in Orlando in 2011 as a three-day gathering for fans and creators of online video. 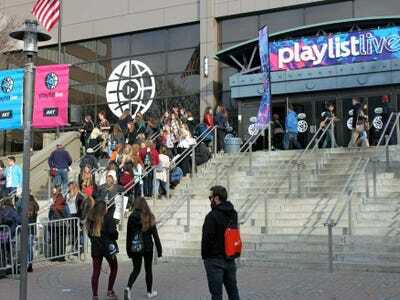 This was the first Playlist event to be held in the Tri-State Area, so we weren't sure what to expect. 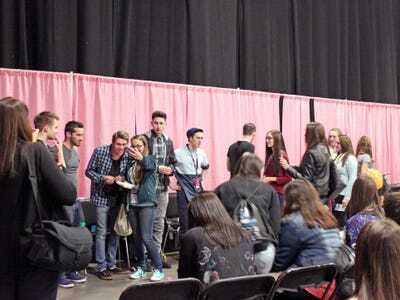 Thousands of teens had shown up to meet their favourite YouTube stars. The vast majority were girls who had come with friends or their mums. 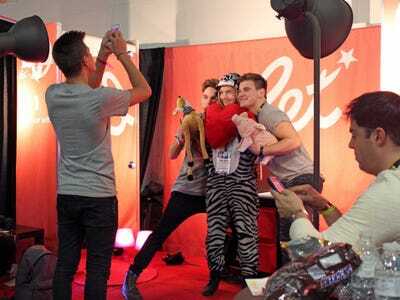 A major draw of events like Playlist is the chance to hang out and get pictures with YouTube stars like these guys. It's that accessibility that sets YouTubers apart from mainstream celebrities. 'They're so relatable. They're just the nicest people ever. I love them,' Gia told us. 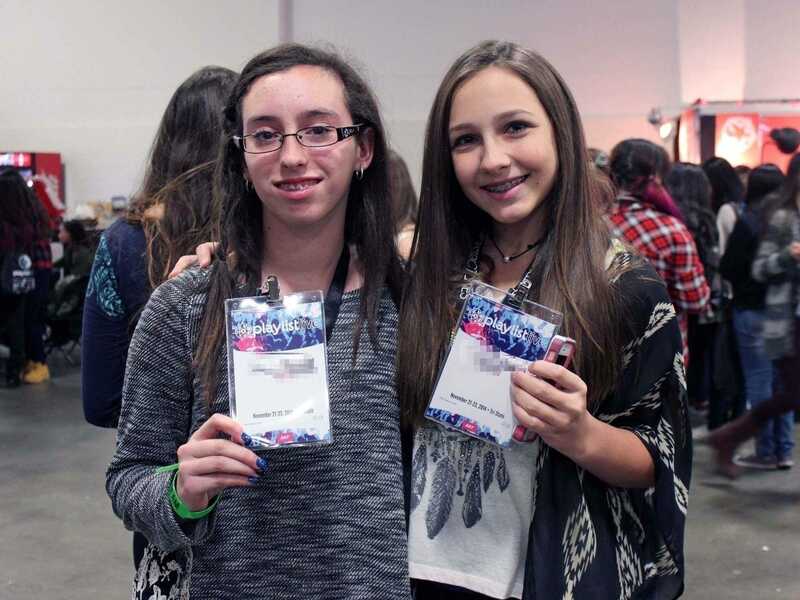 Stacey and Christina were waiting in line to meet Luke Korns and Mikey Murphy. This was their first time at a YouTube event like Playlist, and they traveled over an hour to get there. 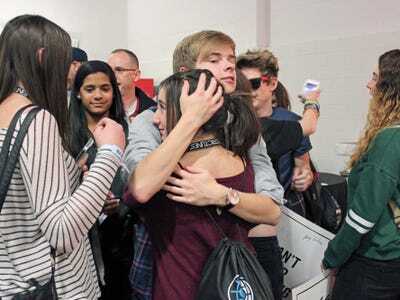 Mikey Murphy came around to give everyone a hug when his meet and greet was over. Everyone was extremely excited to meet him. 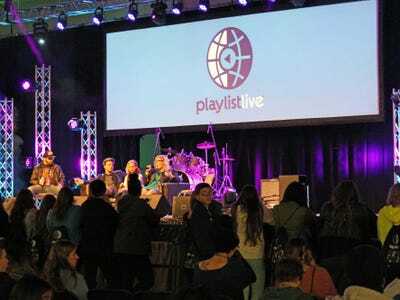 While some fans waited in line to get autographs and take pictures, others gathered around the main stage to listen to panels led by YouTube experts. 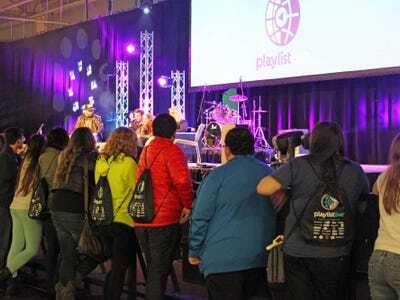 Lots of teens had the same drawstring backpack bearing the Playlist logo. One creator remarked, 'Wow, look at this crowd,' after taking a Snapchat video of the screaming fans. 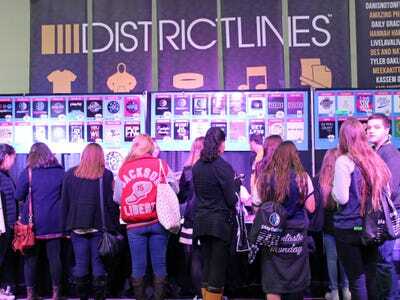 There were also some booths set up by YouTubers or other online-video companies. 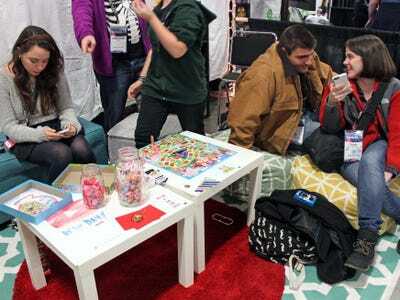 A station from YouTube creator Strawburry17 had big bowls of sweets and teens playing Candyland. 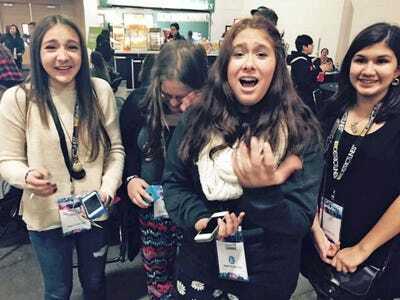 Kristen said she and her daughter once waited in line for six hours to meet YouTube star Bethany Mota. Unfortunately, they never made it to the front of the line. 'I'm the best mum,' she laughed. 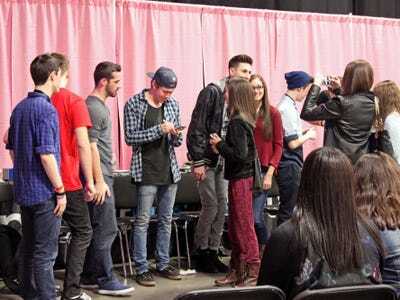 We caught another meet and greet with Settle Down Kids, a seven-man comedy group whose arrival caused a huge crowd of girls to scream. Plenty of selfies were taken. 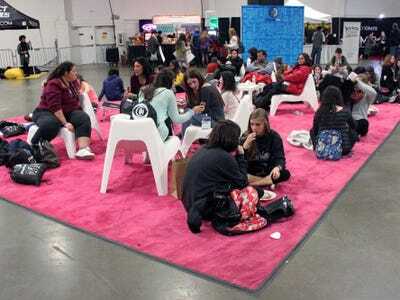 There were tables where fans could grab some YouTube star merchandise. 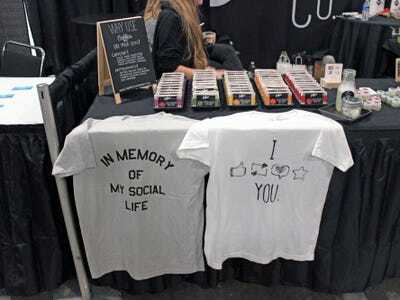 Some of the shirts invoked a little social media humour. 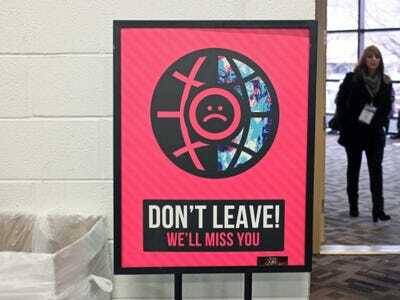 When the event was over, this sign seemed sad to let us go. 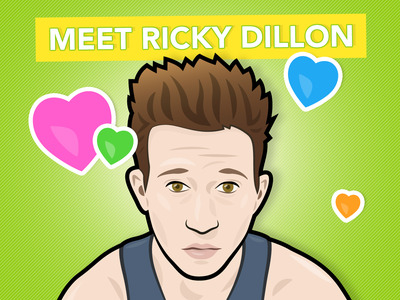 Now get to know one of the stars from Playlist.